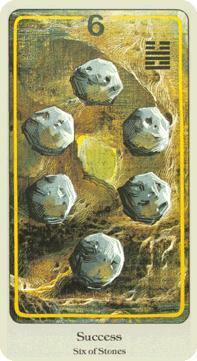 Today's Draw: Six of Stones from the Haindl. What do you still need to achieve to be successful? What is your relationship with success? What do you think makes people successful? 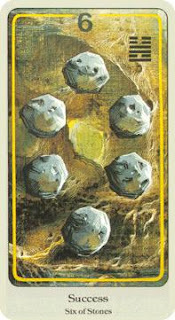 The Six of Stones (aka Six of Coins) is about abundance and success. But what really is success? And does it have anything to do with abundance? And what about abundance...what is that? It's no secret that we live in a society that considers social rank and material items a sign of success. But one of the things that became clear from the housing bust is appearances don't make things so. Many of those people living in the big homes and nice neighborhoods aren't successful at all. They're in debt up to their eyeballs, continually accruing more debt to keep up appearances. But the illusion of success isn't all about money. I can't tell you how many friends who have problems in their relationships look at their friends' relationships and say "why can't we be like that?" What they don't realize is how many people are looking at THEIR relationship with some idealized vision of what a relationship should be. What this comes down to, is that success can never be seen on the surface. And it can never be found by measuring yourself up against others. It's not something that emanates from outside sources or milestones you've reached. Rather it's something that comes from inside. It's about knowing you've done your best, whether others say so or not. Knowing that what you have is enough, even if it doesn't seem to be as much as the guy next to you. Understanding that life is less about what you have and more about who you are. Having the integrity to follow your convictions. And being grateful for having the chance to do all of the above. It's so cliche, but it really is the quality, not the quantity, that counts. YOU are who decides whether or not you're a success, not some arbitrary rule-of-thumb society has latched on to. And the same goes for abundance. Start practicing gratitude and you'll begin to see how abundant your life truly is...the love you give and receive, the beautiful little moments...even just the fact that you woke up this morning. These things that we spend our lives looking for—love, happiness, wholeness, success—they're hiding in plain sight. Just like when Dorothy asked Glinda how to get home to Kansas, you've had the power to get there all along. In fact, you're probably already there and just don't know it yet. Amen on the success and on feeding the good wolf. I relate very strongly with both blogs. It's as if you were speaking directly to me. But I am, lovey Rita Meter Maid. :) Thank you for affirming the messages. This whole week has been interesting for me.